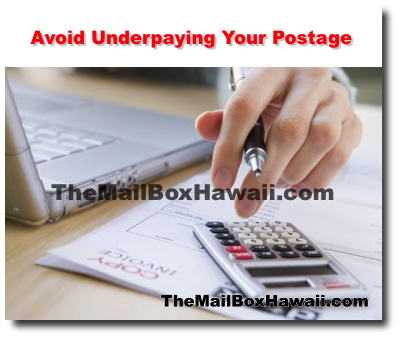 Underpayment can result in the recipient being charged for the extra postage or may delay your delivery. If your mail weighs 13 ounces or less and has the correct postage, you can give it to your USPS mail carrier or drop it off in a blue USPS collection box. But if your mail weighs more than 13 oz and you're using stamps to mail it, it is best to take this to your nearest Post Office and have them assess the correct postage. If you leave it in your mailbox, the carrier may leave it. It may also be returned to you if you drop in off in a USPS blue collection box. Lastly, remember that USPS rounds up the weight of your package so if your package weighs 4 lbs and 5 oz., it would be charged the 5 lb-rate.